Michael Porter’s groundbreaking ideas on competition and strategy have unfolded over three decades and are spread across a dauntingly long list of publications. Every manager can name individual pieces of his work - competitive advantage, the value chain, five forces - but no one, not even Porter himself, has put the entire puzzle together to reveal it as an integrated whole. 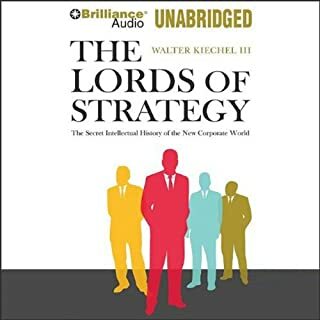 This lucid, concise audiobook does just that. Written with Porter’s full cooperation by Joan Magretta, his former editor at Harvard Business Review, this book provides an engaging summary of Porter’s ideas and an invaluable synthesis of this important body of work, making clear how each of Porter’s powerful concepts relates to the others and, most important, to the practical realities managers face. Modern thinking about competition and strategy begins with Porter’s frameworks. They are the most widely used in practice by managers around the world. But as Magretta points out, Porter is often misunderstood and his frameworks misapplied. Magretta’s own wide-ranging business experience allows her to identify the most common of these misconceptions - among them, the deeply held but dangerous belief that competition is about being the best. Understand Porter and you will see why competing to be the best sparks an inevitable race to the bottom. Understanding Michael Porter will enable all leaders throughout any organization to grasp Porter’s seminal ideas about competition and strategy and deploy them to achieve competitive success. 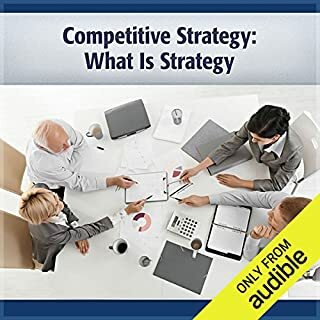 The content of this book is excellent and it is one of the best books I have read on commercial strategy in a long time. It is a really thorough and clever summary of Porter's work, presented in a really accessible way. I have read a lot of Michael Porter's work previously but I still found that I got a lot out of this in the more 'macro' form it is presented in here. Unfortunately, the narrator makes it really hard to follow at some parts which in my view made this hard to get through. I nearly abandoned the audio and bought the kindle version just so i could stop listening to him. The writing of many great thinkers can be difficult to follow. Their great points are often much clearer in the hands of other writers. Author Joan Magretta demonstrates this with the works of Michael Porter. It seems that most executives are aware of Porter, but few bother to read Porter because it's difficult reading. Magretta's work takes that barrier away. Everyone directly involved in business strategy needs to know Porter's thinking. "Understanding Michael Porter" is an excellent way to do it. One of the biggest and most common flaws Porter finds with typical business strategies is that they fall into the trap of thinking that if the company is the best at something, that will make the company successful, and further that there's something unique that the company can do to be the best. In reality, all the competitors are working hard to execute well. Striving to be the best is a zero-sum game that has everyone copying everyone else and that does not lead to profitability. Rule #1 is not to make this mistake. From there, Porter gets more complicated, describing the various types of strategies that can lead to superior profitability. The key thing is differentiation. Managers must make emotionally difficult decisions to ignore some opportunities so that they can focus on others. 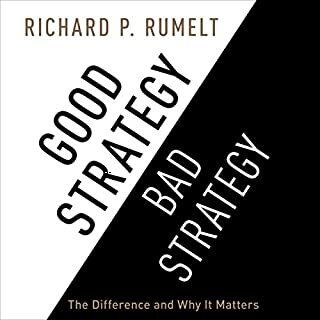 In my consulting work, I apply a simple test to determine whether the strategy avoids the error of aiming just to be the best and embraces differentiation. Write out the strategy in one or a few sentences. Reverse the meaning of the strategy statement. If the result sounds somewhat plausible as a strategy, then you have a real strategy. If the result sounds ridiculous, then you have a ridiculous strategy. Several reviewers have commented negatively on the performance given here by Erik Synnestvedt. I concur. The reader has an odd and annoying sing-songy drawing out of the end of most sentences, depending on the vowel sounds involved. You can hear it in the sample. At first it doesn't seem so bad, but after a couple of hours of it, it gets increasingly annoying and distracting. What made the experience of listening to Understanding Michael Porter the most enjoyable? I would rather get kicked in the head by a horse ... A horse that was formed by merging several horses into one, such that the leg that kicks me made of 10 horses. The narrator made me want to punch babies and then set the world on fire just to watch it burn. Voice-over detracted from the story. Would you try another book from Joan Magretta and/or Erik Synnestvedt? Probably not. The reader had an unique pronunciation that negatively affected my reading experience. I am a Porter fan. 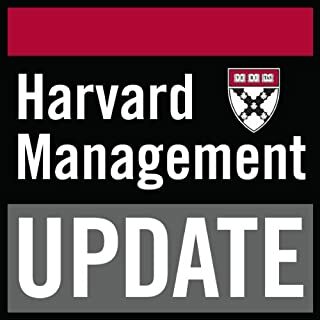 Was Understanding Michael Porter worth the listening time? I have already purchased 5 extra editions for colleagues and friends as a must read. This book greatly links strategy and the daily decisions we make on what to do. What was one of the most memorable moments of Understanding Michael Porter? I never experienced strategy work to provide value - it has seemed more as management exercises than a roadmap for the organisation. I always felt that Lean, Process optimization etc. was overkill. Rather my focus has been on delivering value to customers with a pragmatic approach. A must read for anyone genuinely interested in understanding the links between company profitability, customer value and activities performed within the organisation. I really dislike the narration. 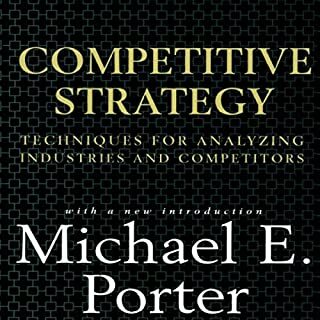 This is a concise distillation of Michael Porter, who changed the academic business world by his insights on competition and business strategy. The summary is written by Joan Magenta, a Bain Capital alum who worked directly with Porter. It is accurate to the original Porter material. It even captures the evolution of Porter's insights over the years. Because of the author's own experience in the business world (as opposed to having only academic business experience) the principles are presented so they can be readily understood by business professionals. Magretta's experience as an editor shows in her writing style. She writes concisely, precisely, and with humor. I didn't expect to laugh while reading a precis of deep academic work. But I did. Bravo. If you don't have the time to digest years of Porter, this short work will serve you well. On the other hand, if you studied Porter, but your "Five Forces" summary is getting rusty, this is a great refresher. Finally, if your MBA came, not from Harvard Business School, but was awarded by the business school of hard knocks, this will give you insight into an important part of what your MBA-burnished colleagues were supposed to have learned about competition and business strategy. You may even find that Magretta imparts more Porter than your business school associates can recall. A different narrator. His pronunciation was so awful, it was a distraction. Has Understanding Michael Porter turned you off from other books in this genre? The problem is, because of the odd narration, I do not understand Michael Porter. Yes, get another narrator then let everyone who attempted to listen to this version have it free. This is valuable information ... That I don't have although I paid for it. Many of us have well thumbed copies of Michael Porter’s Competitive Strategy. 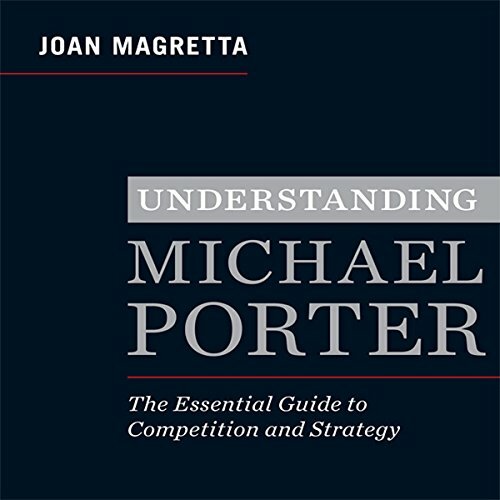 Now Joan Magretta has made his work available to a wider audience with Understanding Michael Porter: The Essential Guide to Competition and Strategy. Think of Magretta’s book as a companion to Michael Porter and you will be right on point. Realistically, Porter’s book is not overly difficult to understand, but it does take study and some background. The strength of Magretta’s work is that Porter’s models become clear immediately. If you have read and understand Michael Porter this book is still valuable for its concise, relevant example and context. Readers from business settings will primarily benefit by this book, but decision makers from the not-for-profit sector will gain from reading this book as well. Read very well by Erik Synnestevdt . 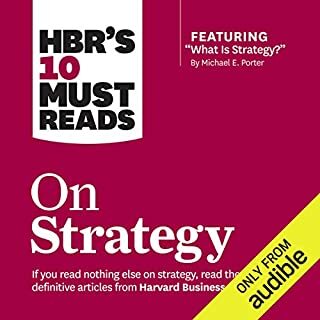 It is hard to dispute Michael Porter is the master of strategy theory. For most, his books are dense and hard to read. not because they are poorly written, but because they intellectually profound and full of knowledge. Jon Magretta has succeeded in creating a 'Porter for the rest of us' that makes the teachings of Michael Porter accesible and easy to understand. It is not really 'Strategy for dummies' as the book assumes a good level of business acumen. While I was already familiar with most of Michael Porter's thoughts I found this book to be entertaining and enlightening. This is not a book I want to listen to during my commute as it would make it impossible or dangerous to take notes. And I took plenty. The book is well organized and well summarized. I particularly liked the summary at the end and and the FAQs. Absolutely must read for anyone leading a business. The book has good content, but the narrator uses the same annoying inflection on almost every single phrase. This made it very, very difficult to listen to for me. The book is fine, if not very helpful. as the description says Magretta does not try to teach you anything you cannot get from Porter himself. She only tries to build examples that would make Porters points more clear. The narrator however is something else, never before have I heard a more annoying reading of a book. He blitzes through most of the text and then for some reason draws out the last word of almost every sentence. Great overview of Porter's work with very clear explanations and examples. Annoying narration but worth staying with. Great review and dive into Porters work. May seem like old stuff, if you're already familiar with and practicing Porters work on strategy. But does add important new insights, applocation ideas and reminder and reinforcement of key ideas. If you haven't read and applied Porter, then ot is essential reading. Well structured, well paced, and brings together the best of Porter's genius insights in an easily digested format. Highly recommend it! Good content , poor narration. Would you try another book written by Joan Magretta or narrated by Erik Synnestvedt? Who might you have cast as narrator instead of Erik Synnestvedt? Not sure but someone else. If you could sum up Understanding Michael Porter in three words, what would they be? What other book might you compare Understanding Michael Porter to, and why? I read alot of business books so i cant say whether one stands out. What does Erik Synnestvedt bring to the story that you wouldn’t experience if you had only read the book? He was very clear, I can say that it was very easy to listen to and I have remembered alot of it. It was very powerful so I cannot recommend it better than that. It really made me think about my own business. There are some basic concepts in here that are very useful. Most people in business, simply run from on year end to the next without trying to change things. The main features of porter writings come out in this book so it will help you develop your own, even at a very basic level which is exactly what is needed, if you even just want to make small changes each year, to better your working life which will impact your outside life too then. Really enjoyed this book, stuck to several key themes which made it very vivid. I learned alot from this book and am reviewing the strategy in my own business or the lack of it as it turns out! The author really does achieve the stated aim of a powerful exec summary of the main Porter works. Five forces, leads onto the key strategy points, all of which are well explained. The examples throughout fit really well, and give a bit of a break from the detail. I really struggled with the delivery though. As a Brit, I am used to listening to US narrators on audiobooks. However, this one pushes things just a little bit too far - it is Stra-te-gy, not Strad-er-gieee! I'm afraid that Mr Synnerstvedt is the reason why I haven't started my second listen yet to pick up all of the things that I missed first time round. it is more clear than Porter himself.